With Spring in the air and Summer on the horizon, children everywhere are looking forward to once again using their backyard swimming pools, jumping waves at the beach, or visiting their local swim centre. As parents it is our job to ensure our kids are water safe. Michele Hatch a highly experienced swimming teacher gives us a few things to think about. 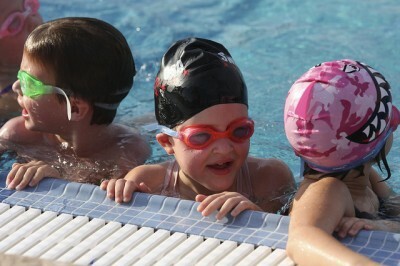 Swimming lessons through a swim school usually starts around the age of three years. This is because children at this age are now toilet trained, have better concentration, separate from you without distress, are more receptive and able to better wait for their turn. Three to four years of continuous lessons is about normal for an average child. Some parents give up on the swimming lessons because “the child didn’t like it”. I say they don’t necessarily have to like it, but they do have to do it, but it is vital to make it as enjoyable as possible. Sometimes the dislike can from something as simply as the swimming cap. Rubber caps pull hair and it hurts! Use cloth caps to help keep the experience fun and not to be avoided. Of course there are many things that can be done before kids start lessons to get them on track to being water smart. The best thing you can do as parents when it comes to water safety is to provide opportunies for your children to play with water. Start your child with water familiarity. Splash their face in the bath or shower. Allow them to play in different forms of water such as the kitchen sink, the hose and puddles. Take them to the pool and swim with them. Get them to move their legs in the bath, both on their back and front, and make water out to be something not to be feared, but respected. A great skill for kids to have is to know that if they fall or jump into water, that they know how to turn around and push themselves up to grab the side. Kids who tend to fall into water don’t automatically think to turn around to assist themselves in getting out. Some parents make the mistake of believing that simply because one child found learning how to swim easy, that their brother or sister will too. This is a common mistake, and one that parents seem surprised by. Some kids need more patience, more time and even more praise before they begin to feel confident in the water. I recommend that if you send your child to swim school that you leave it to the swimming teachers to teach them. Children can become easily confused if both parent and swim school are trying to teach. If you do wish to assist in teaching your child, pay close attention at swimming lessons, and ensure that you are teaching the same methods and techniques as the teachers. If your child ends up in trouble in the water, it will more than likely be you who is first on the scene. Can you swim well enough to save your child, and do you know how to do CPR? Parents with swimming pools at home should have attended CPR training. This only costs you around $50 and takes just one evening. Get a group together and do it. Michele Hatch is a Registered Nurse and worked for many years at the Royal Alexandra Hospital. When Michele’s children were young, she understood the importance of them knowing how to swim so put them into swim school. Twenty six years later, Michele has had extensive experience as a swimming teacher and continues to have a passion for kids and water safety. The swim school closed in 2013, please remove this page.